After a session of bicycle packing the tourism program recommenced. We walked up the hill past the Blue Mosque and observed a heavy police presence, including armed officers and a water cannon, at the nearby Hippodrome. An Istanbul man told us that they were there to keep a close eye on a group of Greek people who had come to pray at the Haghia Sofiya Mosque. There’s a fair bit of history behind all this but it seemed a bit heavy handed. Our wanderings took us close to the Grand Bazaar which we had to avoid in order to prevent an anxiety incident for Ian who has an aversion to the place. Instead we roamed around nearby narrow and crowded streets where there was also a lot of commerce occurring. As we have seen in other areas, the businesses cluster together in themes. These included: manchester (voluptuous frilly bedspreads are the thing); clothing suitable for modest Muslim women; underwear; suits; head scarves; belts and buckles; kitchenware; uniforms. Eventually we arrived at the enormous Suleymaniye Mosque which is currently undergoing extensive renovation and is closed to visitors. 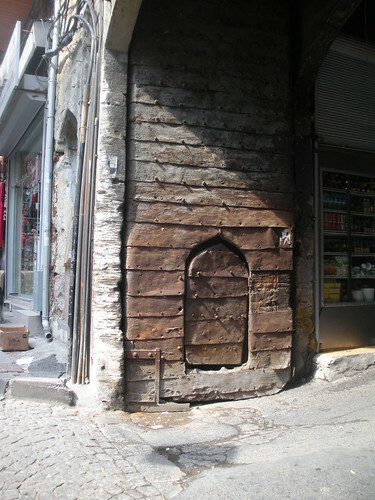 We could enter the tomb of Suleyman which also holds the remains of his wife and some other sultans. Then down the steep hill to the Iskelesi (ferry terminal) to take the ferry up the Golden Horn to Eyüp Mosque, a greatly revered Islamic site for Muslims, as it is reputed to be the tomb of the prophet Mohammed’s companion and standard bearer. It is a place that attracts many Islamic visitors as well as pigeons. As a tourist it is often a little unclear where the boundaries lie. I was headscarfless so took my cue from others and did not enter the tomb or the mosque. We did receive a piece of Turkish delight that was being distributed, we think, because of a family religious occasion. We saw several young boys decked out like princes in white satin suits with fur-edged capes and understand that this is usual for the celebration of their circumcision. We’re not sure whether these boys have just had the snip or are about to. Either way they seem surprisingly relaxed and comfortable. 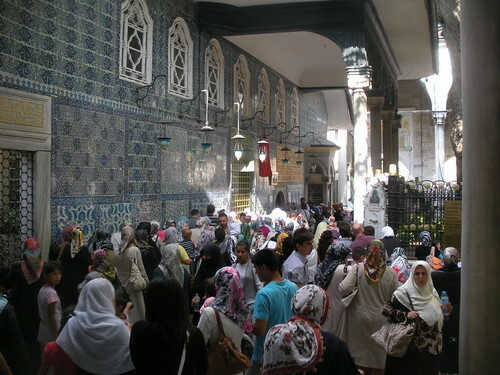 Adjacent to the mosque is a busy street of shops selling food, souvenirs, head scarves and religious books. On both sides of the Golden Horn are densely built up hills with apartment buildings and numerous mosques. We decided to take the tram from the ferry terminal and bought tokens for 1.50 Turkish lire. The trams are constantly packed with passengers, but we squeezed in. There is a festival during which free simitçi and tea are available near the Blue Mosque. We will investigate tomorrow. We have now been to the hamam – it was enjoyable although slightly bewildering for a first timer. This entry was posted on 17 September 2010 at 7:36 pm and is filed under Turkey. You can follow any responses to this entry through the RSS 2.0 feed. You can leave a response, or trackback from your own site.